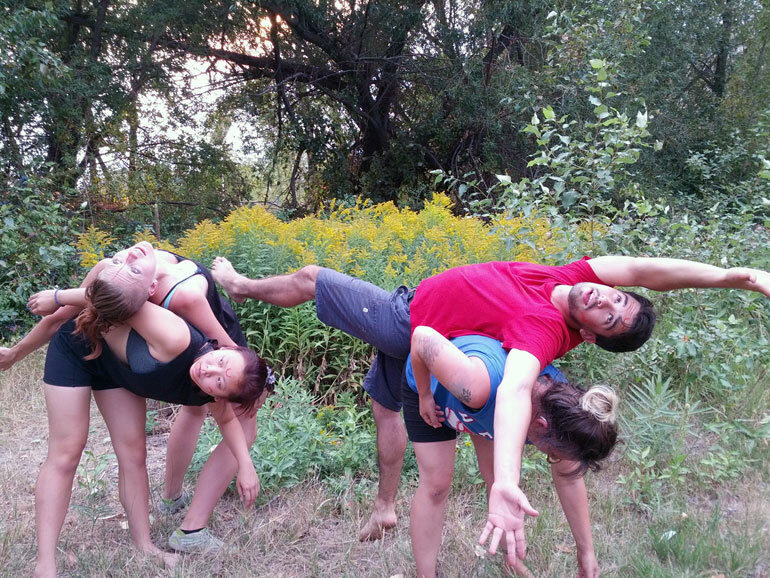 Performance artists Bȧo Linh Le, Janelle Sheppard, Scott Mendoca, and Rhian Jack work on a scene from 'Murmurations'. When: Sunday, August 23, 7 to 8:30 p.m.
Interactive artist Sarah Megan Hunter has created Murmurations, the next performance in the Bee Central series at Brent’s Grist Mill Heritage Site in Kelowna. Bee Central is a Community Art Pollinator Project sponsored by UBC Okanagan and the City of Kelowna and takes place at the historic Brent’s Grist Mill Heritage Site at the corner of Dilworth Rd. and Leckie Place. Hunter says the live performance art piece is inspired by bees, early developmental movements in humans, and the study of Jodorovsky’s “Psychomagic” — the use of specific movements to heal trauma by accessing the unconscious mind through symbolic action. “The performance will inspire participants to dance, to use their voices, and interact with a group as they explore elements of ceremony and rites of passage,” says Hunter. Hunter, a creative writing major at UBC’s Okanagan campus, is working closely with interdisciplinary performance artist Rhian Jack, and improv vocalist Kathleen Baker. Murmurations is supported by the Bee Central Community Art Pollinator project and funded by a Faculty of Creative and Critical Studies undergraduate research award. Bee Central is part of a larger plan to introduce and stimulate a ‘buzz’ about bees and the Brent’s Grist Mill Heritage Park, particularly to attract a diverse community to help with the planting, building and maintaining of a Public Art Pollinator Pasture in Kelowna, explains UBC Assoc. Prof. Nancy Holmes. Murmurations is the third community art event sponsored by Bee Central this summer and it takes place Sunday, August 23, from 7 to 8:30 p.m. Admission is free and tea will be served. The final Bee Central event will be Mason Bee Homes, with Lori Mairs on September 26 starting at 11 a.m.
Bee Central is made possible by a Community Public Art Grant from the City of Kelowna and UBC’s Eco Art Incubator. For more information about UBC Okanagan Eco Art Incubator projects or to become a volunteer, please contact Holmes at nancy.holmes@ubc.ca, 250-807-9369. More information can be found at: http://blogs.ubc.ca/theecoartincubator/ .